Fresh is best, followed by frozen, dried and canned. Vegetables are the powerhouses of nutrition, and what is least consumed in a typical diet. Vegetables, being low in calories, should form the bulk of our diets, since we all love to eat. Fresh food is best locally grown, since then it isn’t wasting gas being shipped, and losing nutrients on the way. Knowing all this, we should all be growing as much of our own food as possible. However, once you grow all this goodness, what do you do with it? Learning about canning and freezing is it’s own field of learning. Also, what do you do with all that kale? Broccoli- the leaves are greens too. 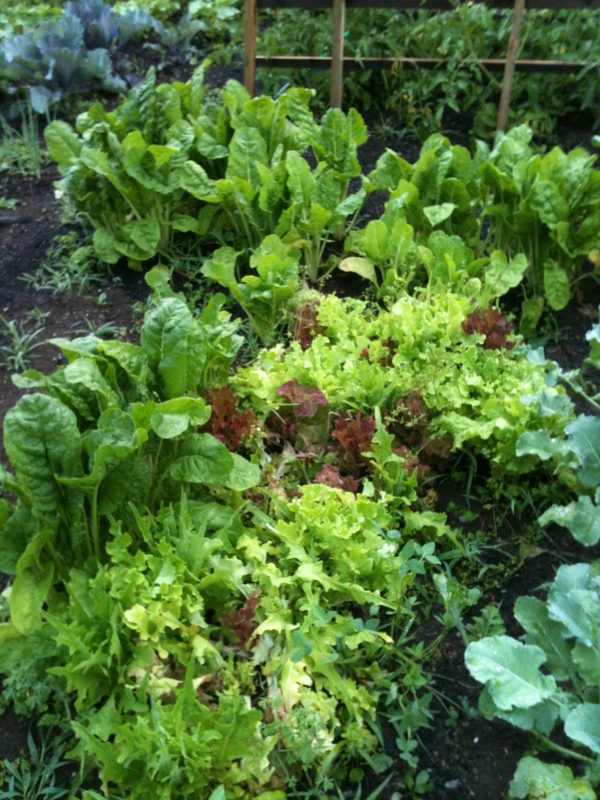 lettuce and chard- all greens can be used interchangeably. Yes, you can cook lettuce. 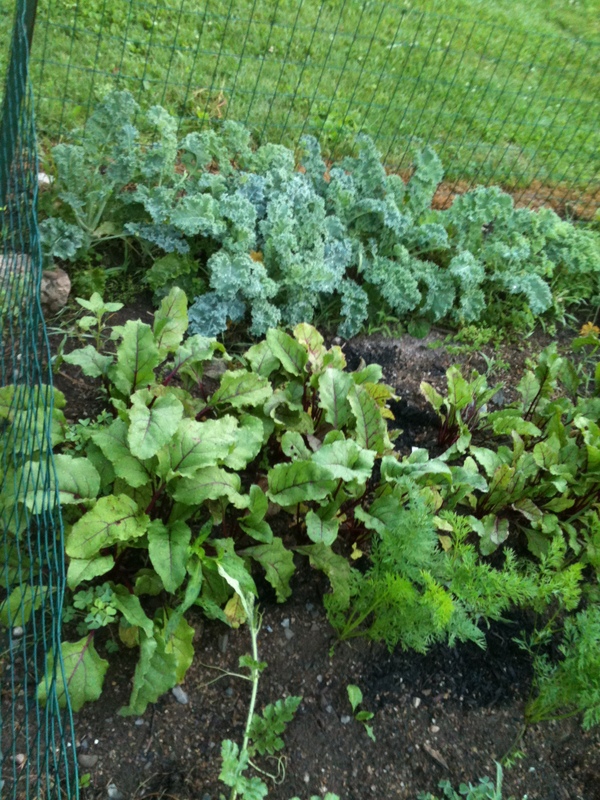 more greens, kale and beet tops. 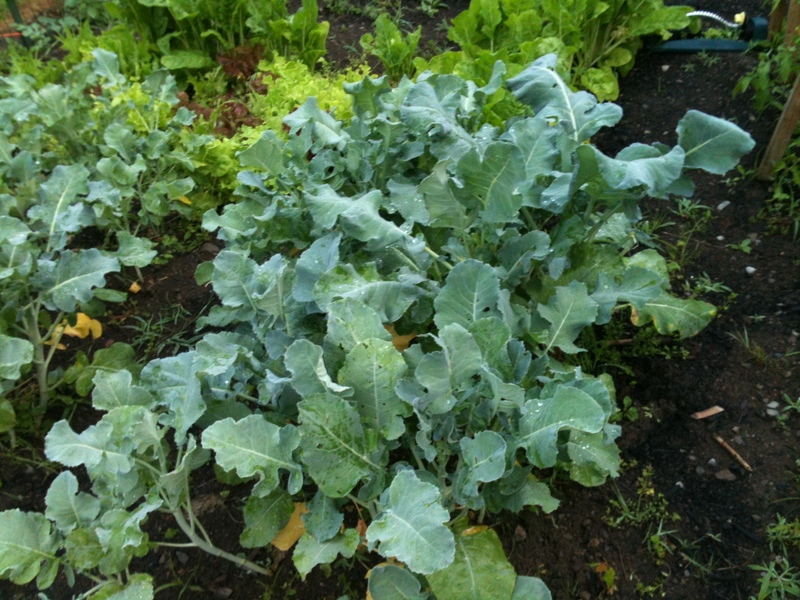 As you can see, you can be harvesting from your garden from early spring- don’t wait to put the lettuce, peas and spinach in, all through the summer, but much of that is just the greens. Those are the most nutritious parts, but how often can you have them sauteed or in a salad before you get tired of them? So I have been experimenting with getting ways more greens in. I have my little magic blender knock off, and I’ve been pureeing the greens and adding them to my morning oatmeal. Many people make green smoothies, blending the greens with fruit and milk. When kale is blended, it has a lovely fresh green taste, like eating summer. However, I realize that many people would not find that appealing. I’ve also chopped them and added them to my tuna or pasta salads. I think that is great, but again, I would add a little at a time, gradually increasing the amount to get used to it. As you can tell, I’m all about grinding them up and using them as biomass. First, you can get a lot more in you in an unobtrusive fashion. If I stuff my little blender full, it grinds down to about 1/4 cup. This also gets you past the texture problem, as kale and broccoli can be a bit tough. I’m still working on how to get this mixture into other foods, to get the less enthusiastic members of the family on board. Today I tried adding it with eggs. M-m-m-m, looks yummy, doesn’t it? Now, that looks better. Not. I don’t know how it looks to you, but it looks better than it has a right too and wasn’t bad tasting. So this was the finished product. It tasted better than I hoped. My biggest complaint was that it was a bit dry. 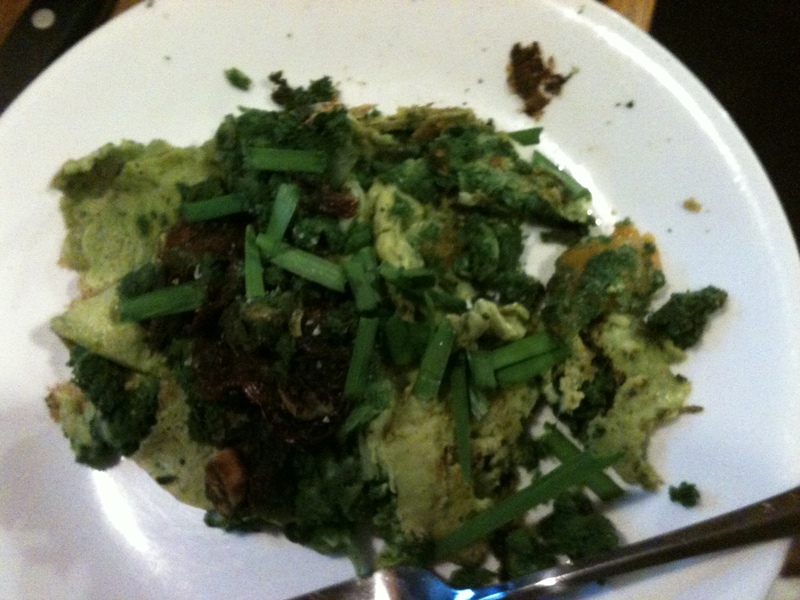 Don’t blend your eggs- it takes all the structure out of them, taking away that “eggy” texture. It was odd that it was dry, since you have to add some liquid to blend the kale, and veggies are mostly liquid. 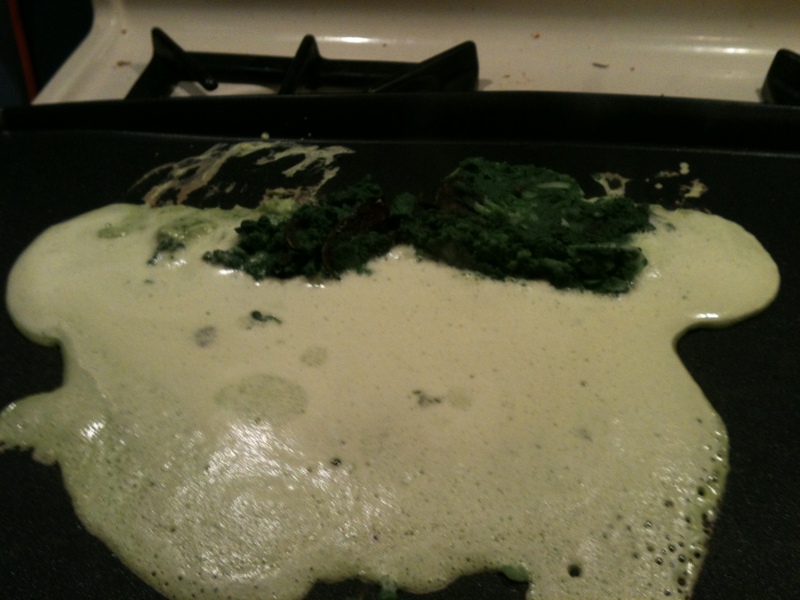 I probably cooked the greens too long. I will try this again, it was good enough to do that. 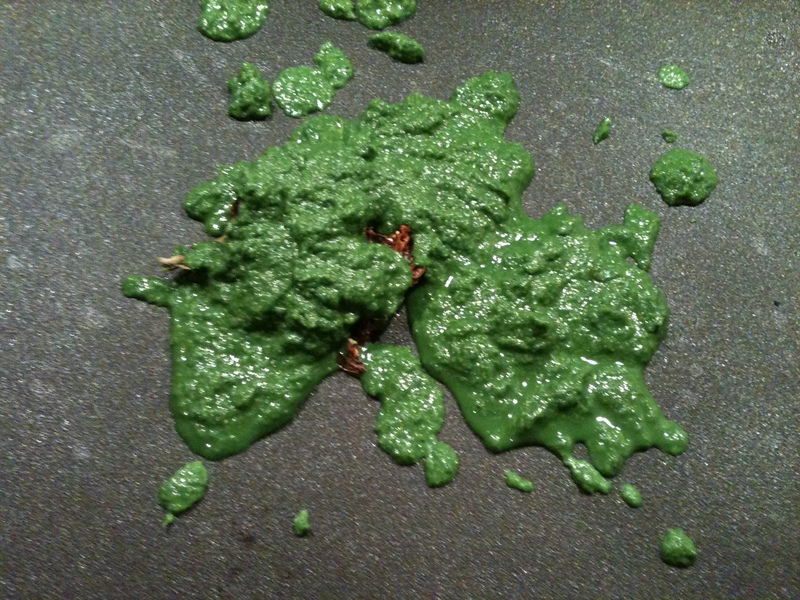 In other veggie cooking news, kale chips are all they are cracked up to be, and more. Very addictive. I wonder if my other greens can be cooked the same way? I’ll try and let you know.